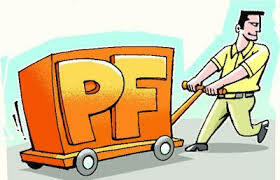 Use PF for Home Loan? If there is a shortage of amount to fulfill your dream, and if it is more than five years since your Provident Fund had started, you can think of the last resort, your PF amount. Whether EPF or PPF, it is the amount saved for the post-retirement benefits. Employee Provident Fund is a retirement benefit applicable only to salaried employees. It is a fund to which both the employee and employer contribute 12 per cent of the former’s basic salary amount each month. This percentage is pre-set by the government. The contribution which is payable by the employer to the Provident Fund of the employee is set at 12 % of “basic salary, dearness allowances and retaining allowance”. Which means, the employer contributes 12% of Basic component of the salary to the Provident Fund. However, contribution by employer is bifurcated into a) contribution to Provident Fund and b) contribution to Employees Pension Scheme. For example, on a basic salary of Rs. 6500/- p.m., 8.33% is contributed to Pension Scheme from employer’s share of contribution. The maximum amount that will go to Pension Fund is Rs.541/- per month. i.e. 8.33% of Rs.6500/- (Rs 541.45). On a basic salary of Rs 10000/-, 12% (Rs 1200/-) contribution by employer would be contributed in the following manner: Rs 541/- would go to Pension Fund & Rs 659/- would go to Provident Fund. The PF accounts will now yield a return of 8.75 per cent annually. 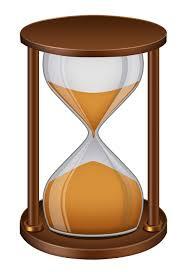 Usually, the amount is paid at the time of retirement or resignation, whichever occurs earlier. In the case of a change of one’s job, the amount can be transferred from the old company to the new one. Know about the tax benefits. Additionally, the amount invested in an Employees Provident Fund is exempt from tax under Section 80C of the Income Tax Act. Withdrawal from an EPF is subject to tax if it is carried out within 5 years of employment with the same employer. For instance, if an employee’s gross salary is INR 50,000 pm and Basic Salary is INR 20,000 on which Provident Fund deductions are INR 2,400(12% of INR 20,000). Since income tax is levied on Gross salary, the salaried employee should deduct Income Tax on INR 50,000, but the employer deducts only on INR 47,600 (INR 50,000-2400) since salaried Employee’s Provident Fund amount is exempted from Income Tax; since it is a retirement benefit. But when the salaried employee withdraws before retirement that will be considered as normal income, hence TDS (Tax Deducted at Source) will be applicable on the withdrawal. In case the salaried employee does not fall under a 30% Income Tax slab, he can claim back the TDS amount from the IT department by submitting his Income Tax returns with the help of TDS certificate(as issued by the PF trust) and Form-16. Repayment of Home Loan Should have completed at least 10 years of employment. Alteration or Renovation of house Should have completed at least 5 years of service. 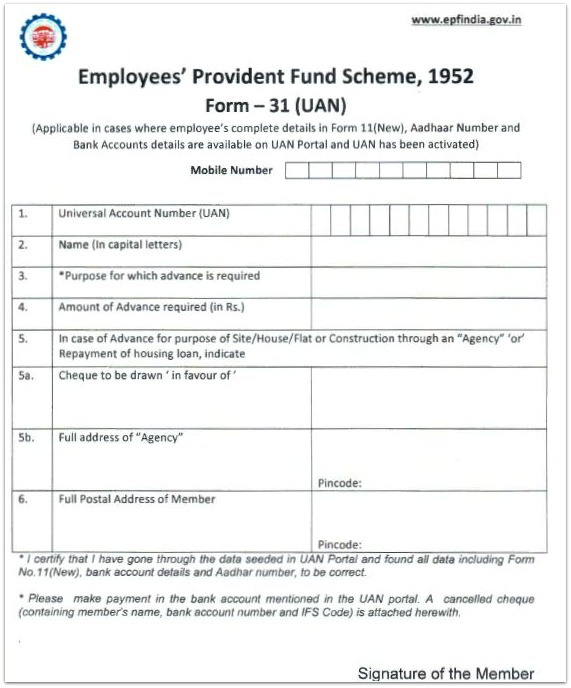 To withdraw your EPF, you need to fill up Form 19 (which can be downloaded from www.epfindia.org) and submit it with the previous employer. With the Form 19 duly filled in, signed and attested by the former employer, you need to submit this along with other documents, such as resignation acceptance letter or relieving letter and a cancelled cheque of your bank account, to the EPFO of your jurisdiction. Withdrawal of money from the account is permissible only if you are in between two jobs or have been unable to find another for over two months. 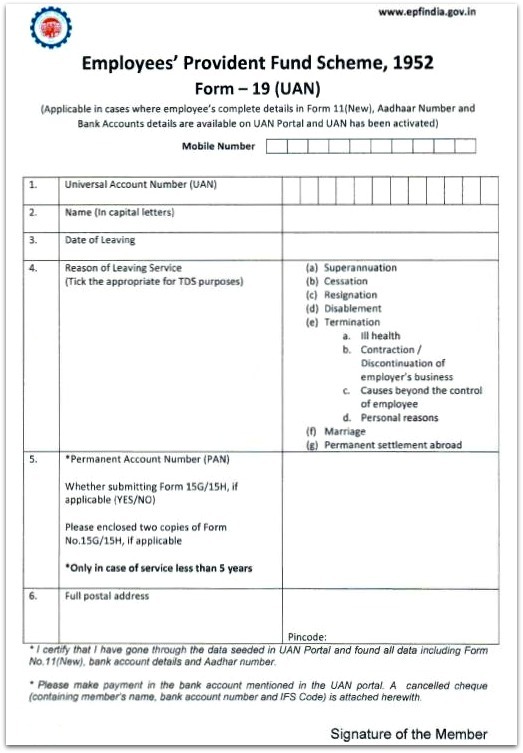 Learn about PF withdrawal forms. The new PF claim forms are very simple and easy to fill. EPF members can submit them directly to respective jurisdictional EPF office. You can also submit these new forms directly to the EPF Commissioner online. The withdrawal or claim benefit will directly be credited to your bank account. 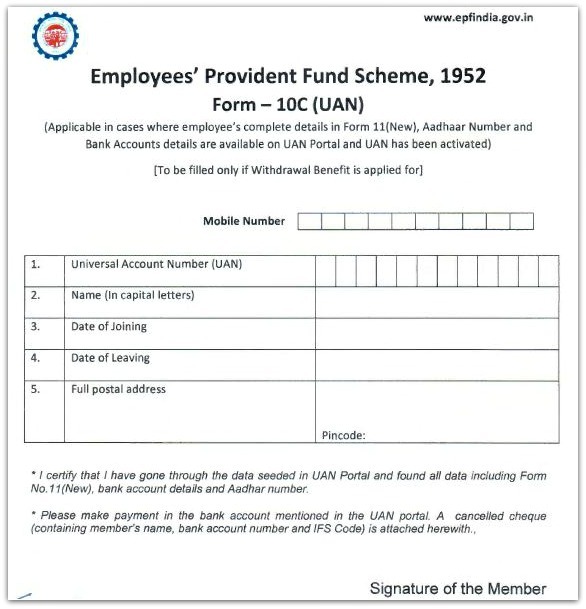 New Form 10c (UAN) for EPS Pension withdrawal benefit. Look at the new Form 10c UAN. You have to provide details like your mobile number, UAN, Name, Date of Joining, Date of leaving and full postal address. New Form 31 (UAN) for Partial PF Withdrawals / Advances. Look at the revised Form 31 UAN by clicking on the below image. You have to provide details like mobile number, UAN, name, Purpose of advance, amount and other details about your loan requirement. If your Aadhar number and Bank details have not been seeded and your KYC form is not verified by your employer, you have to make your claims of withdrawals in existing (old) Form no 19, 10C & 31 only. You may download old and existing EPF withdrawal forms by visiting EPFO’s website. When can you go for PF amount. Out of very minimal schemes which have good returns and with tax exemption, PF is one, in India. If you can refrain from using this amount, it is the best. Or if you are confident that you can save so much as you withdrew before you retire, you can take the road. The only reason you should have enough amount in PF account is you should not look down for help after you retire. Know more about tax benefits on the PF account. Tax benefits with PF account. Author keerthiPosted on April 30, 2016 July 26, 2016 Categories Loanyantra1 Comment on Use PF for Home Loan? With the change of the interest rate calculation methods, a constant change in interest rate is expected, though not every month but every quarter, in a minimum. Home loan is a long term loan and customers,usually, prefer floating rates. Rates keep changing and expecting a lower interest rate for the whole tenure of 20 year is impossible. So, what is the right time to take a Home loan ? The Property you intend to buy is good and cannot be missed or it is expected that the price of property will rise. If you can fix the EMI in your monthly budgets. Reports show that Home Loan Market in India is Rs.9,70,000 crore in size. Market is growing at 15.6% per annum over the last 10 years. But India’s GDP is only 8% whereas developed countries’ is at 60%. But if we look at Indian Government’s initiative or Plan of housing for all, by 2020 India needs 11 crore homes. In last 5 years, property prices have increased by more than 72%, but the median income has not. It makes the houses unaffordable for several borrowers. Though the real estate market is stable right now, we should take the advantage of the situation and the interest rates too. Join with us for even lesser interest rate and pay less on your home loan. Know the interest rates of several banks and how much loan each bank provides on your property. For more information logon to www.loanyantra.com. Revised Interest rates by banks as per MCLR. Earlier were the days when banks used to play around with the interest rates. With the new introduction of interest rate calculation by RBI, since April 1, 2016, the competition amongst banks is running on a high speed. Banks have to review their interest rates every month and publish on a pre-announced dates. Also, full-fledged review of the customer’s risk profile is high in priority before lending the loan amount and in deciding the spread and the final interest rate. So, how is it advantageous to customers? Solution to this question lies within the following question. Did banks ever observe the change in base rate and implement in their interest rate? To make it practical…imagine you borrowed loan amount at 10% interest rate. Out of which, say, 9.5% is base rate and 0.5% is spread. If RBI changes the base rate to 9%, your interest rate is supposed to be 9.5% (9% +0.5%). But what happens in reality, the banks with unknown reasons, increase the spread. 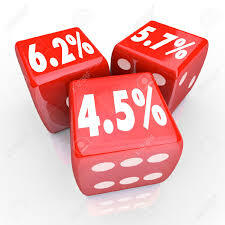 Instead of 0.5%, the banks can take a chance to increase the spread to 1%. Now, with MCLR in existence, banks should consider the customers risk profile in detail, to decide on spread. Banks can’t easily get arbitrary with spread changes. What will be the impact of 0.25% lesser interest rate on home loans? The longer the remaining tenure, greater the impact. The saving can be in hundreds per month. But, when you calculate you end up saving atleast a month’s EMI. A cut in small savings rate is likely to bring down bank deposit rates and ultimately lead to a drop in lending rates as well. For a borrower in April 1 get loans at the prevailing MCLR (9.3%), but a month later a new borrower might get a loan at a lower MCLR if the cost of funds drops. For the April borrower, it will take three more quarters for his loan to get reset. In other words, there could be 12 sets of one-year MCLR if cost of funds change every month. Corporate customers are also likely to look at shorter term loans to take advantage of falling rates. This will mean that banks which borrow for longer terms but have give term loans will face an asset-liability mismatch – though the only issue there is that bank earnings become volatile, they don’t usually face a crisis because of that. Observe the revised interest rates by various banks..
To know more about MCLR, its calculation and the difference between base rate and MCLR, refer the following link. Author keerthiPosted on April 25, 2016 Categories BANKS, Fixed Interest Rate, Loanyantra, MCLRLeave a comment on Revised Interest rates by banks as per MCLR. How to calculate EMI manually. Whether buying a car, buying a new apartment or affording overseas education to children, loans have become an integral part of our life. When we borrow a loan the most accepted methods of repayment is through EMI or Equated Monthly Instalments. It is the small amount including both the principal and interest, to be paid towards a loan we opted for. During the initial stages the interest alone constitutes the major part of the EMI but as we progress in the payment, during the course of time, the portion of interest is reduced and the principal amount is added to it. While you borrow a loan, you are given an option to keep either the tenure or the EMI constant. While one of the above parameter is kept constant, the other parameters will be reduced. i.e., if you opt to keep the tenure as a constant value, then the EMI will be reduced. Or if EMI is paid at a constant rate then the tenure of the loan is reduced. Logon and become a part of loanyantra’s customer base to get more alerts and suggestions. 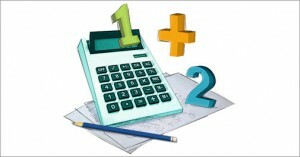 Author keerthiPosted on April 5, 2016 Categories EMI Calculator, Loanyantra1 Comment on How to calculate EMI manually. Clever step when you have low interest rates from bank. For the EMI payers, those are the magical words. Be clever and plan your EMI. Understand that EMI has two components. 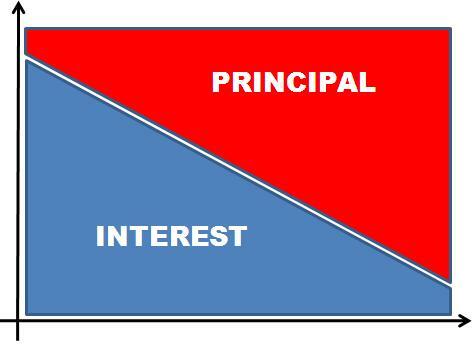 a) Principal and b)Interest. Always ask your lender for the break up of your EMI. Get clear idea about the components. You do not expect to waste lot of money with the tempting tagline of Low EMIs. Let us remove the low EMI motive from our mind. Now, let us target that we must pay lower interest component to the bank. You can approach the bank that has the lowest interest rate. But apply a trick. Do not reduce the EMI. In this scenario, you are brilliantly covering the principal amount component along with less interest component. You win half the battle here. Whenever the bank offers you to pay low EMI, do the math. You must not increase the duration and pay higher interest. In fact, you must concentrate on covering the principal amount component. Let us understand this theory with an example. If I am with a home loan of Rs.30,00,000 at an interest rate, 9.6% for 12 years, my EMI will be Rs.35,000. Where on a large scale, the break up of principal and interest component is 40.75% and 59.25%, respectively. For example, if the bank offered a low interest rate of 9.3%. Your EMI lowers down to, Rs.34,000. The clever step here is to go and opt for the 9.3% interest rate, and keep the EMI constant, i.e., Rs. 35,000, instead of reducing it to Rs. 34,000. Mention the bank personnel that you want to add that Rs. 1000 to your principal amount. So, automatically, the principal amount comes down which leads to early closure of your home loan. Check out and calculate more by following the link below. We wish you to stay happy even when you are with the loan. Author keerthiPosted on April 5, 2016 Categories LoanyantraLeave a comment on Clever step when you have low interest rates from bank.